The Third Man is one of the great post-WWII films of all time. Part pulp/film noir, part absurdist comedy, part je n'est sais quoi, the film is all about strange intersections. British filmmaker Carol Reed, paired with Orson Welles and his protegee Joseph Cotton all end up in dark, historical Vienna, and amidst the gorgeous black and white yet modern cinematography is the great Zither score by Anton Karas. As Roger Ebert puts it, "The sound is jaunty but without joy, like whistling in the dark. It sets the tone; the action begins like an undergraduate lark and then reveals vicious undertones." So come check out The Third Man. Why? Because as MP contributor Mike puts it "because it's good, that's why." Screening at Boa Taverne Modern (5301 St. Laurent). Free Admission. Popcorn and drinks available. Come by anytime after 8:30. The story concerns a an out-of-work pulp novelist, Holly Martins (played by the brilliant actor Joseph Cotton), who arrives in a war torn Vienna looking to solve the mysterious death of his ex-school friend, Harry Lime (Orson Welles). As the story unravels a dark underground labyrinth of corruption and cynicism emerges. 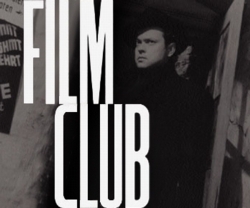 The film also features one of the finest performances of Orson Welles career, despite his brief appearance. And all you film distributors and studio heads who are wondering about rights et al...meet me on top of the Ferris Wheel at the town fair, I'll set the record straight for you. er...yeah, i was supposed to come up w/ a reason why i wanted to have this filmed screened. um...how's about "cuckoo-clock"? but seriously, this not only my favourite all-time movie but it's not even close. Chinatown and Dr. Strangelove are a distant second for those who care.